running of Paris-Roubaix, one of the oldest events on the cycling calendar. But allow me to rewind. We arrived on Friday evening and settled into our charming, bijou B&B, much lauded (and rightly so) on the internet. I had made the booking back in January and had elected to stay close to the race finish in anticipation of the usual adverse weather conditions. prosperous times. Indeed, at the start of the Industrial Revolution, the axis of Lille-Roubaix-Tourcoing represented the world’s second most important place for wool production. Occupied twice by the Germans and blighted by the slump in the 1930s and competition from the Far East for cheaper textiles in the 1950s and 60s, Roubaix had fallen on hard times. It’s now a town in transition. The Neptune inspired municipal baths have been reborn as an art gallery. Inward investment through far-sighted political partnership with local businesses has increased employment opportunities for the largely immigrant population in call centres and shopping outlets. Attracted by the grand housing stock, families have moved out of Lille and embarked on massive renovation projects. However, the terraced houses and semi-commercial properties leading to the Roubaix velodrome still speak of poverty, despair and decay. Back to dinner, which we ate in a restaurant in the town square, where the food was surprisingly excellent. I wouldn’t call Roubaix a one-restaurant town but we weren’t exactly spoiled for choice. Saturday, we hopped onto the tram to Lille and renewed our acquaintance with that town. This had been a regular overnight stop on our many skiing trips to Switzerland and Austria. We would stay in the Hotel Carlton and eat in the restaurant opposite. Both were still there but Lille too has been the subject of significant renovation and pedestrianisation. Sunday morning, dawned fair and unseasonably warm. After an excellent breakfast, we walked to the velodrome and found a spot within sight of the big screen, giving us a clear view of the track with easy access to toilets and refreshments: perfect. Television coverage started just before 13h, and, as expected, there was a group of escapees. The pace was high largely, one assumes, because of the fine weather. It was reminiscent of 2007, when Stuart O’Grady won, with clouds of dust billowing around the riders. Our first taste of live racing was the arrival, just over an hour later, of junior Paris-Roubaix raced on a similar, albeit shorter, terrain. It was won by a local French boy (Florian Sénéchal) who, having attacked in the Carrefour de l’Arbre, arrived on his own into the velodrome to finish arms aloft across the line. A second French boy (Alexis Gougeard) won the sprint out of the chasing group to finish 2nd ahead of a Dutch boy. All the finishers were covered in dust and many bore the scars of skirmishes with the pave. A collective groan echoed around the stadium as over on the big screen Tom Boonen (QuickStep) was seen stranded at the roadside with a puncture seemingly waiting forever for his team car to reach him. Finally, he got going again only to be felled moments later. He was down and out. Meanwhile, further up the road three of the favourites were making their move. Fabian Cancellara (Leopard Trek), Thor Hushovd (Garmin-Cervelo) and Alessandro Ballan (BMC) were within 25 secs of those still up the road: Manuel Quinziato (BMC), Baden Cooke (SaxoBank), Juergen Roelands Omega Pharma-Lotto), Lars Bak(HTC-High Road) and Johan Vansummeren (Garmin-Cervelo). However, neither Ballan nor Hushovd, with team mates up the road, were willing to share the workload. the velodrome ahead of the pursuing pack which by now included Cancellara, who sprinted to finish 2nd. Martin Tjalingii (Rabobank), one of the original escapees, completed the podium. The winner celebrated by asking his long-term girlfriend to marry him. Over half the peloton finished, everyone was covered in a thick layer of dirt and, like the youngsters, many bore the scars of their encounters with the terrain. So far the major Spring Classics have sprung a few surprises with the so-called favourites losing out to less fancied team mates but who have nonetheless clearly merited their wins on the basis of “he who dares”. Fabian has been undeniably the most consistent but his team needs to be reinforced; he cannot be expected to win on his own. Quickstep was beset with a whole season’s bad luck on Sunday with an excessive number of punctures, falls and broken bikes. Not exactly the best advertisement for Eddie’s bikes. Sun burned, but happy, we made our way back to the B&B to freshen up before heading into Lille for dinner. An excellent race, with the drama unfolding beautifully for TV viewers such as myself. Felt sorry for Tom, whose race-ending crash was caused by, of all things, his water bottle dislodging and getting jammed in his wheel. 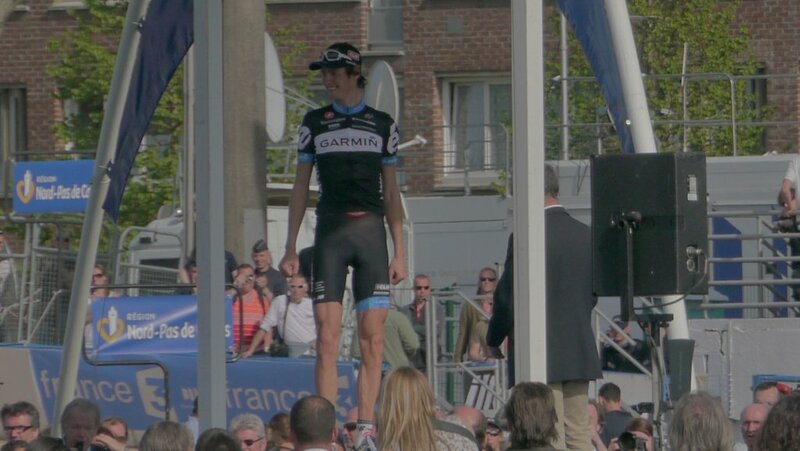 Really pleased for Van Summeren (for both the win and his engagement). He’s been in the shadows for so long in service of his team leaders, and he rode a superb race to get up to the lead group and then ride away on the Carrefour. And Cancellara was magnificent in defeat. He was clearly strong enough to win in better circumstances, but it underlined just how important the team is in cycling. Garmin-Cervelo got their tactics right for once, and although Fabian was understandably frustrated there was no need for Hushovd to ride. What a Classics season it has been so far! Spot on Tim, it has indeed been a fabulous season to date. I can hardly wait for the next three races. Bring on those Ardennes hills.